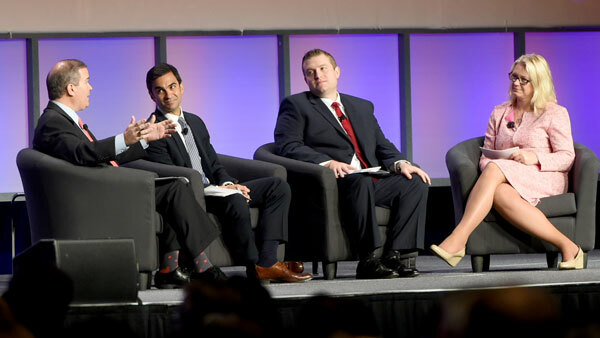 FSI's Dale Brown joined other experts at the ConnectED conference in San Antonio to address the practicalities of DOL's fiduciary rule. Left to right: Dale Brown, Richard Loconte, Joe Terry and Erica McGinnis speaking at the ConnectED conference fiduciary panel in San Antonio. A panel of experts urged advisors affiliated with the AIG Advisor Group to read up and speak up on the Department of Labor’s proposed fiduciary rule, despite the fact that the official regulatory comment period is over. “No one disputes the intentions, but they do [dispute] the details,” said Dale Brown, president and CEO of the Financial Services Institute, speaking before 2,000 advisors and 1,000 other guests at the AIG Advisor Group’s ConnectED conference on Tuesday in San Antonio. “We are waiting to see the final proposal, which we expect to see … in the spring of next year, and we know we will see it before January 2017, when President Obama leaves office,” the FSI CEO explained. The wider AIG organization, which has some 30,000 employees, “has been reaching out to Congress and has sent 11,000 messages to the DOL” about the proposal, according to Richard Loconte, deputy head and associate general counsel of federal government affairs for AIG. Several members of the panel addressed the practicalities of the expected regulatory shift. “If you have clients in IRA accounts, you will be affected,” said Joe Terry, chief supervision officer of the AIG Advisor Group, which includes close to 6,000 affiliated independent advisors and four broker-dealers (FSC Securities, Royal Alliance Associates, SagePoint Financial and Woodbury Financial Services). It is possible that advisors will need to ask clients to sign contracts in order to affirm that the advisors and clients have discussed the clients’ best interest and specific product details, for instance. In addition, the new rules could strongly discourage advisors from keeping small client accounts on their books, once they’ve done the cost-benefit analysis on this business. In light of such complexities, the panel members urged advisors to get better informed and begin speaking to clients about what may lie ahead. —Check out AIG Advisor Group Is ‘Island of Stability’ in BD Space: Exec on ThinkAdvisor.